With being in the marketing and advertising industry, it is a requirement for me to continuously be researching new advertising tactics in order to advice my clients accordingly. I’ve always advised most my clients away from Groupon but this is the first time I’m actually writing about it. This past month I’ve been pondering my decision to leave Scottrade. I opened up an account with TradeKing (If you register for TradeKing through this link, we both get $50) mostly based on positive reviews about their customer service and their good pricing on trades and options. Now that my balances are higher, I’ve slowly been increasing my trading activity. I haven’t dived into option trading just yet but with regular trades at $5, I’ll be saving about 28.5% in transaction fees… not much if it’s only like two to three trades per month but my volume is heading towards the 10-20 trades range. Registering and signing up was easy as well as transferring funds via ACH. In fact, you don’t have to open a bank account with TradeKing to do ACH transfers (unlike Scottrade). So far, I spend most of my time in TradeKing Live. As I get a bit more free time, I’ll imagine that I’ll qualify for TradeKing Quotestream in the next couple of months or so. But for now, I have mixed feelings about TradeKing Live. TradeKing Live is an ajax based web application and although it seems to be live streamed data, I do get a slight feeling of sluggish responsiveness. Perhaps I’ve just really gotten used to Scottrader Streaming Quotes. I’ve really enjoyed using Scottrader Streaming Quotes. It’s a Java based application and it can be customized to a great degree plus it feels very responsive compared to TradeKing Live. I like the fact that I can pretty much do everything in Scottrader Streaming Quotes, including push updates on the latest headlines and being able to view tick-by-tick orders; something you can’t do in TradeKing Live (or at least I haven’t figured out how). TradeKing Quotestream may change this for me, but I won’t be able to take it for a test drive until I qualify for it with a minimum of 10 monthly trades. So far, my disappointment with TradeKing Live in comparison to Scottrader Streaming Quotes is what’s swaying me to keep my account open at Scottrade for now. However, I’m still going to stick with TradeKing as well for their lower transaction fees. If I had all my trading funds and securities with Scottrade, I would qualify for ScottradeELITE and take that platform for a test drive but for now funds are split between TradeKing and Scottrade. I’m currently staying with both, Scottrade and TradeKing. I’m envisioning using Scottrade for my long-term investments (although their lack of DRIP is still a big negative) and using TradeKing for my short-term stock/option trading. On a side note and in full fairness, Scottrade did email me with a correction and notified me that I will be keeping my ACH withdrawals. I do not have to open a Scottrade Bank account to simply do ACH withdrawals… so that’s a big plus that has helped me sway my position as well. So it seems my recent blog, Scottrade is Forcing Customers to Use Scottrade Bank, has gathered quite a bit of interest from friends, colleagues, readers, and especially Scottrade. Since posting my blog on March 15, 2013, I’ve been contacted by Scottrade via phone by the local branch manager and via Twitter by what I’m assuming is Scottrade’s PR department/agency. In fact, Scottrade has also followed me on Twitter. A couple of days ago I received an email from Scottrade notifying me that my check writing privileges for my brokerage account were being terminated due to inactivity for over a year. They nicely recommend that I open a Scottrade Bank Account instead. Ironically, I just recently signed up for check writing privileges about two months ago and have actually used it. I really don’t need another bank account. I’ve actually been trying to reduce my number of accounts. I have too many bank accounts and do not want to add another one to the list. Currently, to withdraw funds from my brokerage account, I initiate an ACH transfer from my personal checking account with another institution that I’m completely happy with. 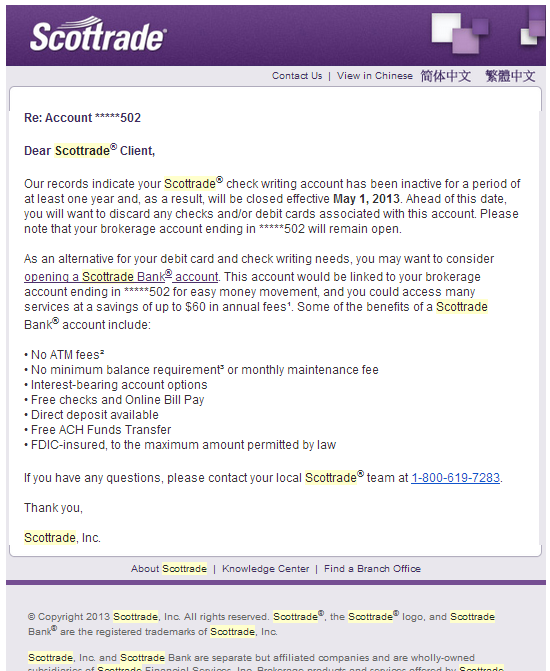 Now that Scottrade is removing check writing/ACH privileges from the brokerage account, I would have to open up a Scottrade Bank account, then transfer from my brokerage account to my Scottrade Bank account, then initiate an ACH transfer from my personal checking account. It’s one more step and one more thing to keep a track off that I shouldn’t have to. There are many brokerages out in the market that offer ACH transfers. Some time ago I wrote about how Scottrade implemented a transfer-out fee for the first time in years. Now I know why they did. I explained my opinion to the local rep on the phone and although he didn’t come straight out and agreed, he did say, “I definitely understand and let me just put it this way… I have been made aware [by managers] that this is a growing concern and ummm… well I’ll just leave it at that.” So there’s definitely been some resentment among other customers at Scottrade. I for one will be transferring my account to another brokerage. There’s plenty of other brokerages out there that are willing to cover my transfer-out fees. Overall Scottrade has been good to me for the past several years, but I’m not liking this new direction they’re taking. The New Roku 3 vs Roku 2 XD, Should I Upgrade? Roku recently announced a new addition to their line of media streaming devices designated as “Roku 3”. I became a Roku fan when back in the day they were one of the few devices on the market to have Amazon Instant Video streaming. Most of their competitors (PS3, Apple, SmartTV’s, BD players, etc) were only carrying the big names like Netflix, Hulu, and Vudu. Most of the time, I don’t sit through commercials on YouTube because my intent is to watch the video I had clicked on and I see the advertisement as an obstacle that I must skip to reach my video as quickly as possible. However, this is probably one of the first commercials on YouTube that I actually decided to watch and not skip just because of how engaging it was. As I kept watching the video, I stayed engaged to the message. I actually made a conscious decision to break away from the instant gratification of watching a YouTube video and clicked on the ad to learn more about it. First of all, I find the product very innovative But in addition, I think the advertising campaign is top notch and I give great props to those behind it. The ad campaign is very engaging and does what it’s suppose to do. The videos have just the right balance of shock and awe with enough humor and common-sense to keep you watching. Orapup’s social media campaign is aces in my book. The most important aspect of Orapup’s campaign is that their focus is context, not hard selling. Except for one of their videos in which they focus more on the product, although still done very well, the rest of their videos follow a general “viral-like” pattern. The ads have a catchy theme that draws interest and just puts a smile on your face. The advertising of Orapup becomes an indirect item. It’s almost as if Orapup is not trying to sell you a product. They’re trying to get you to like the brand. If you go ahead and buy their product, then that’s just a plus. This in effect is what makes their social media campaign a success. I wasn’t really that amazed by this email blast. Nothing really drew my eye, well except for that pizza. But even with that photo, the pizza doesn’t look appealing. Perhaps if they would bump up the contrast and make the colors pop a bit more. The emphasis of this email is the deal price of the Domino’s American Legend Pizza. So why is the price so small and almost lost in the copy? Why is so much space dedicated to a hiring call-to-action? I would imagine that only a very small subset of the email’s target audience would actually be searching for employment. Dedicating such a large portion and driving attention away from today’s promotion for a message that only applies to a small slice of the target-list does not make sense. That space could have been better used in my opinion. The relation between the Super Bowl and this email is a bit on the weak side. The only slight reference is in the subject, “Score a great deal…” Other than that, I don’t see the email attempting to form a direct relationship between pizza and the Super Bowl. I have to give it to Pizza Hut, the timing was perfect. While I received the email blast from Domino’s at 11:36am CST, I received the one from Pizza Hut at 3:13pm CST. With the game only a couple of hours away, Pizza Hut sent out their call-to-action much closer to the decision making point. I prefer the subject line for Pizza Hut’s, “$10 Any: Big Deal for the Big Game”. Not only does it give an eye-popping prize for impulse buyers, but it also has a strong correlation with the Super Bowl. Pizza Hut’s subject line made me want to click on it more to read the email blast versus that from Domino’s. I really like the design of Pizza Hut’s email blast versus that of Domino’s. It’s simple, it’s direct, and it pops. The colors work well together and the right elements have great contrast. “Watch The Big Game With Any Pizza for $10” is large and bold taking the center of attention as it should be. Not only does it stand out, but it repeats the promotion from the subject line. In addition, I like the fact that the entire design of the email is focused on the “Big Game” and creating that correlation with pizza and the Super Bowl. 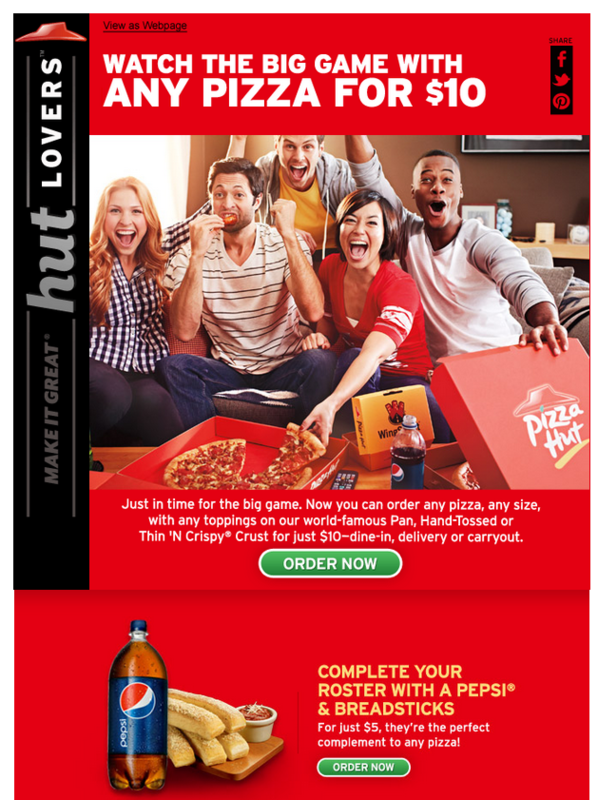 The photo used of a group of friends watching a big moment in the big game while enjoying Pizza Hut is classic. The photo in this email leaves a much better impression than the one in the email blast from Domino’s. 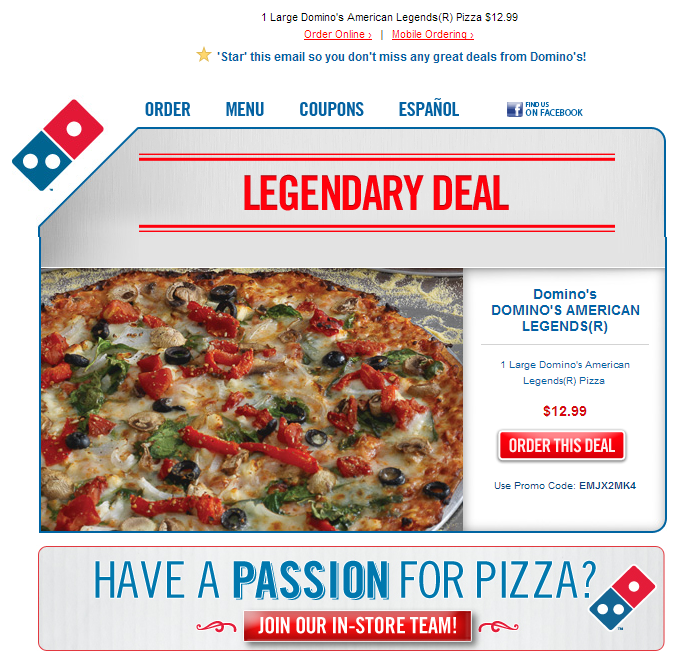 Overall, Pizza Hut just gave a great 101 lesson to Domino’s when it comes to email blasts. Not only was Pizza Hut’s email blast more directly tied in with the Super Bowl, but the overall design, use of colors, upsell opportunity, and call-to-action was more refined and polished hands down.